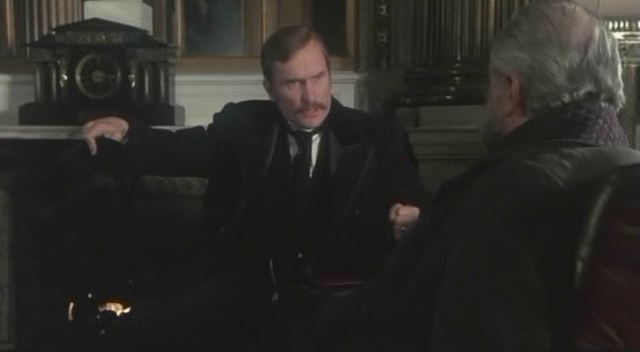 Dr. Watson (Robert Duvall) tricks Sherlock Holmes (Nicol Williamson) into traveling to Vienna to visit Dr. Freud (Alan Arkin), in hopes of encouraging him to cure his cocaine addiction. 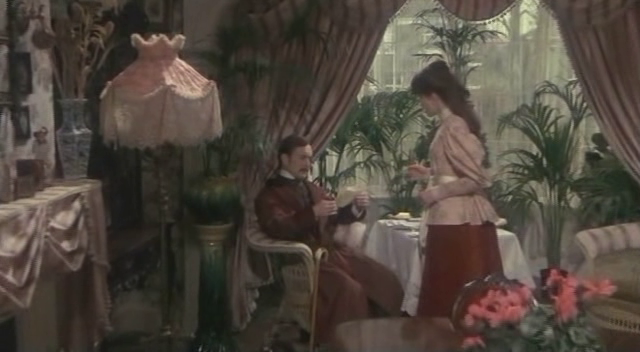 Once there, Holmes temporarily forgets his obsession with his arch-enemy Moriarty (Laurence Olivier) by assisting with a case involving a beautiful, drug-addicted singer (Vanessa Redgrave). 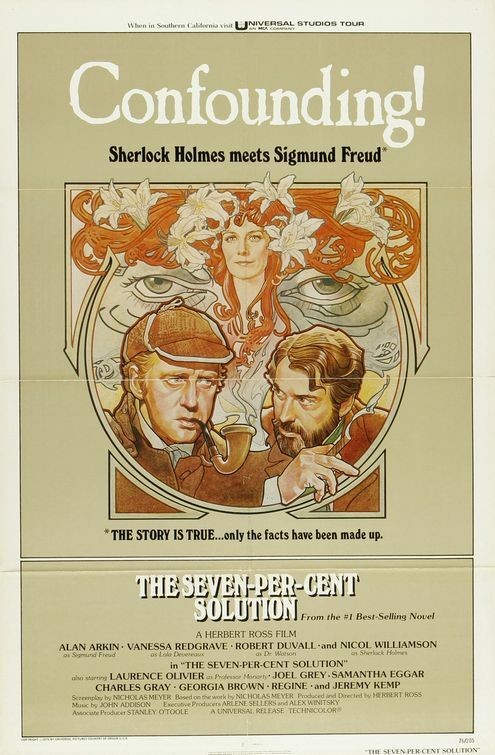 Critical opinions are highly mixed about this Oscar-nominated adaptation of Nicholas Meyer’s best-selling novel (scripted by Meyer himself), which fancifully explores the consequences of Sherlock Holmes seeking help for his deep-seated cocaine addiction from Sigmund Freud. It’s a clever conceit, and works wonderfully well — at least until the screenplay suddenly shifts (in its final 45 minutes) to an outlandish cross-country chase, which many (myself included) agree is an inappropriate tonal direction for the story to take. 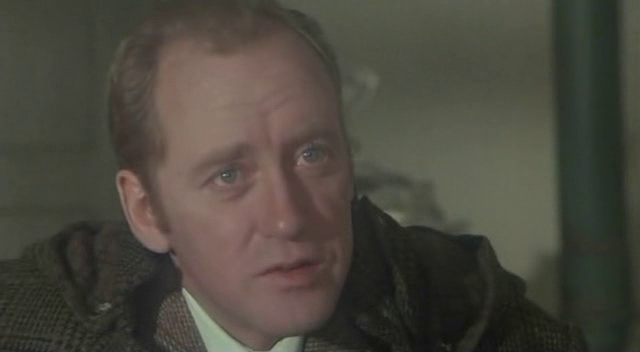 Regardless, there’s plenty in this lushly produced movie for both film fanatics and Holmes fans to enjoy, starting with fine performances by the lead actors — most notably Nicol Williamson as Holmes himself. Williamson was better known on stage than on-screen, but his invigorating performance here makes one wish he’d been given more leading cinematic roles. Duvall is appropriately stalwart and loyal as Dr. Watson, and Arkin imbues Freud with just the right amount of self-confidence and quiet brilliance to be convincing. Holmes and Freud are indeed — as imagined here by Meyer — a perfectly matched pair of deductive minds; it’s refreshing to see Holmes humbled just enough to receive help in solving his lifelong neurotic antipathy towards Moriarty. No, but it’s highly recommended, and a must for Holmes fans. There are a few mild surprises from the actors: Duvall masks himself well behind his accent; Olivier delivers one of his better performances (he’s always best when not hammy). I’m less taken with Williamson but, like the rest of the cast, he’s tied tight to the script’s conceit and there’s little wiggle room for anyone in terms of character development. 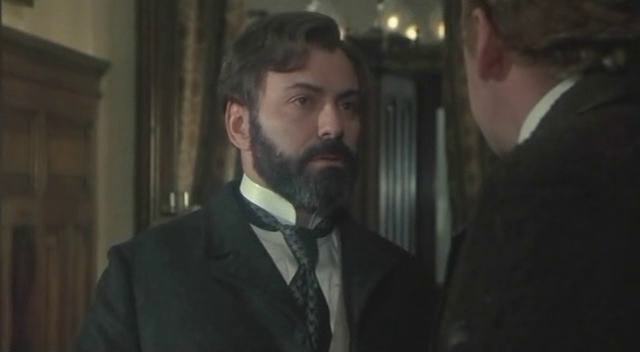 Nevertheless, Arkin manages some fine subtlety – and, though given little to do, Redgrave is especially incandescent later in the story. Director Herbert Ross tends to not make much of a mark on his own films, which often results in a sort of static quality. Out of 25 films, only a few are all that interesting…and ‘The Last of Sheila’* is undeniably his best work. Fave scene: the possibility of death by horses. *’Sheila’ co-writer Stephen Sondheim provided the song used in the brothel scene – ‘I Never Do Anything Twice’ – though it’s not well-served in the film.